Top: Paul Shambroom with his “Dead Animals,” photographed by Daniel Dennehy. 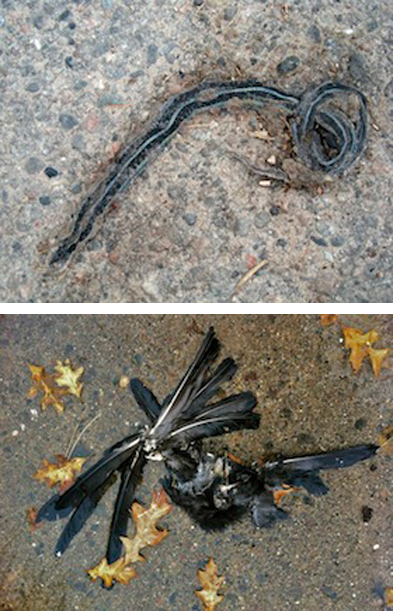 Above: Two roadkill images too desiccated to be palatable to raptors in the “Eat, Prey” show, opening September 6. 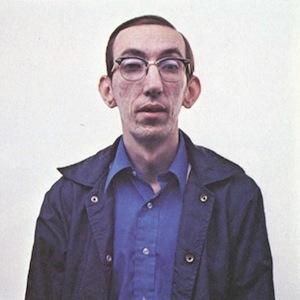 I first met Paul Shambroom while working at Mpls.St.Paul Magazine, when he presented editor Brian Anderson with his idea of setting up a photo booth in front of the Shinders newsstand at Sixth Street and Hennepin Avenue, in downtown Minneapolis, on two Saturday nights. He wanted to capture the avenue’s night owls in the era of the Skyway Theater, the Nankin Cafe, and Augie’s. His portraits of cooks, truckers, and one self-described hustler appeared in our December 1979 issue, next to a two-page ad for Halston perfume. Now the images belong to the Minnesota Historical Society. Shambroom, now 58, made a career of recording his fascinations, including nuclear weapons, small-town council meetings, and weaponry as civic monuments. 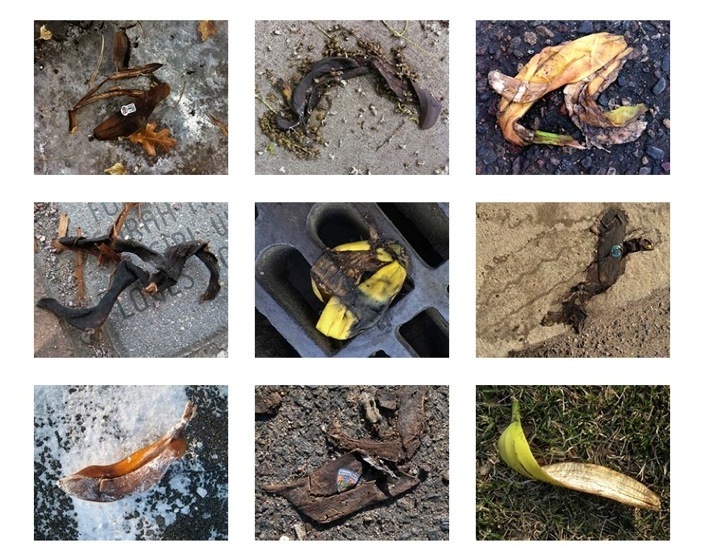 But I also knew he spent his off-hours photographing ordinary things he finds at his feet: banana peels, used condoms, single lost gloves, babies’ pacifiers—and roadkill. “Maybe it’s because I have bad posture,” says the 5-foot-11 Shambroom of his compulsion to shoot things he sees on the ground. Another category of objects Shambroom collects with his iPhone: banana peels. Not every object in Shambroom’s existing roadkill collection made the cut. The snake and bird, though terrific compositions, were too far gone to tempt carrion-eating raptors like eagles, vultures, and condors. So when school ended in May (Shambroom is a photography professor at the University of Minnesota), he took a roadkill roadtrip for this exhibition to find more. Following a tradition known as typology, Shambroom shoots each dead animal in exactly the same way: same degree of centering, same overhead vantage point, same overcast lighting. If it’s sunny, he grabs his windshield sun visor to put the animal in shadow. For a camera, he uses his iPhone. Two hours after finding the squirrel, as he was leaving Peru, Ill., Shambroom saw a dead skunk near an on-ramp. Clearly a head injury. He parked his car in the Ptak Funeral Home parking lot and walked back to the shoulder to take the picture. And no, it didn’t smell. “Maybe the scent glands weren’t busted open,” he theorizes. Iowa yielded a dead deer, also a happy find for eagles except when it is filled with lead shot, in which case it can be fatal. Shambroom’s favorite recent image, however, is a beaver, mainly because it appeared so close to home: near a ditch on University Avenue in Fridley. The final selection for “Eat, Prey” is pictured above, with Shambroom. He is captivated by the gestural flourish of these still lifes, which he compares to drawings and sculptures. “They didn’t die so I could make art,” he says of his mangled finds, but since they met their maker, he’ll make a picture.